One day, when I was a freshman in high school, I saw a kid from my class was walking home from school. His name was Kyle. It looked like he was carrying all of his books. I thought to myself, "Why would anyone bring home all his books on a Friday? He must really be a nerd." I had quite a weekend planned (parties and a football game with my friends tomorrow afternoon), so I shrugged my shoulders and went on. As I was walking, I saw a bunch of kids running toward him. They ran at him, knocking all his books out of his arms and tripping him so he landed in the dirt. His glasses went flying, and I saw them land in the grass about ten feet from him. He looked up and I saw this terrible sadness in his eyes. My heart went out to him. So, I jogged over to him and as he crawled around looking for his glasses, and I saw a tear in his eye. As I handed him his glasses, I said, "Those guys are jerks. They really should get lives. " He looked at me and said, "Hey thanks!" There was a big smile on his face. It was one of those smiles that showed real gratitude. I helped him pick up his books, and asked him where he lived. As it turned out, he lived near me, so I asked him why I had never seen him before. He said he had gone to private school before now. I would have never hung out with a private school kid before. We talked all the way home, and I carried some of his books. He turned out to be a pretty cool kid. I asked him if he wanted to play a little football with my friends. He said yes. We hung out all weekend and the more I got to know Kyle, the more I liked him, and my friends thought the same of him. Monday morning came, and there was Kyle with the huge stack of books again. I stopped him and said, "Boy, you are gonna really build some serious muscles with this pile of books everyday! He just laughed and handed me half the books. Over the next four years, Kyle and I became best friends. When we were seniors, we began to think about college. Kyle decided on Georgetown, and I was going to Duke. I knew that we would always be friends, that the miles would never be a problem. He was going to be a doctor, and I was going for business on a football scholarship. Kyle was valedictorian of our class. I teased him all the time about being a nerd. He had to prepare a speech for graduation. I was so glad it wasn't me having to get up there and speak. Graduation day, I saw Kyle. He looked great. He was one of those guys that really found himself during high school. He filled out and actually looked good in glasses. He had more dates than I had and all the girls loved him. Boy, sometimes I was jealous. Today was one of those days. I could see that he was nervous about his speech. So, I smacked him on the back and said, "Hey, big guy, you'll be great!" He looked at me with one of those looks (the really grateful one) and smiled. "Thanks," he said. As he started his speech, he cleared his throat, and began "Graduation is a time to thank those who helped you make it through those tough years. Your parents, your teachers, your siblings, maybe a coach...but mostly your friends... 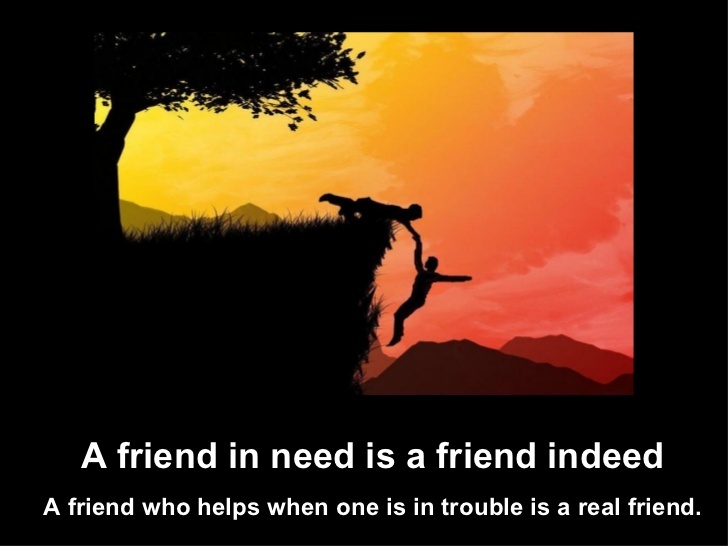 I am here to tell all of you that being a friend to someone is the best gift you can give them. I am going to tell you a story." I just looked at my friend with disbelief as he told the story of the first day we met. He had planned to kill himself over the weekend. He talked of how he had cleaned out his locker so his Mom wouldn't have to do it later and was carrying his stuff home. He looked hard at me and gave me a little smile. "Thankfully, I was saved. My friend saved me from doing the unspeakable." I heard the gasp go through the crowd as this handsome, popular boy told us all about his weakest moment. I saw his Mom and dad looking at me and smiling that same grateful smile. Not until that moment did I realize it's depth. Always remember, "To the world you might be one person, but to one person you just might be the world".